Flights of Fancy felt somewhat like a Hallmark movie in novel form. The rich heiress thrown into farm life with absolutely no idea what she’s doing, while attracted to the wealthy attorney and learning to look after a handful of children. I liked Ian, the attorney and I enjoyed the children. Isadora I found to be rather annoying more than once, but I do think I’m likely the minority there. The did find the story interesting; I’m fond of mysteries and I found this one enjoyable. Unfortunately, I found the number of trailing sentences and ellipses throughout the novel to be quite distracting, as well as the author’s tendency to repeat the same information two to three times. I also found one of the main supporting characters, who was meant to be a voice of wisdom, come off as rather arrogant and obnoxious. As a warning to those among my readers who are younger or prefer to avoid such, there are rather too many references and descriptions to Ian’s muscles and chest, as well. Still, if you’re fond of society lady turned farm girl stories with a touch of the ridiculous, peppered with some truly cute children throughout, I would recommend you read this book. To the KING be all glory! This entry was posted in At the Bookshelf and tagged Book Reviews, Celebrate Lit. Think history is boring? Then you’ve never met Mad King Ludwig, who inspired Walt Disney with his magnificent castle in the clouds. He ruled the German kingdom of Bavaria for twenty-two years, inspiring his people by his support for the arts. And yet, “Mad King Ludwig” rarely appeared in the capital or attended any government functions. He slept most of the day and stayed awake all night. He dined with his horse and waved pistols at servants. He created a fantasy world inside his castles, complete with caves and trap-door tables. To this day, no one is sure exactly what caused his untimely death in a lake. Who was this man: fairy tale king? Insane eccentric? Mad King Ludwig’s life followed many twists and turns on its way to Not So Happily Ever After. The book’s intended audience is young adults, but it is perfect for adults wanting to learn more about Ludwig also. I read this book in one sitting last night. Written in a language that would entertain a middle schooler, the book nevertheless didn’t fall short when it came to pulling in my interest. I feel like I personally got to know King Ludwig II of Bavaria last night; a man who, before that, I had scarcely even heard of. His love of fairy tales and folklore, his intricate and unique castles, his personality and manner of assigning story-like names to real life proved to be captivating. It is no wonder that Ludwig’s people often called him the Fairy Tale King – he earned the name for certain. The book’s title does not lie. King Ludwig meets his end in less then pleasant circumstances and I confess that I didn’t want the book to end in the way that I knew it headed. I am not, however, sorry that I read about the Bavarian ruler. I found myself fascinated by and even relating to parts of Ludwig’s life, and I learned a good bit of history in the process. The photograph’s included of Ludwig and those close to him, added greatly to the story. I’d love to visit Ludwig’s castles and, quite frankly, would love to live in one of them. A real life castle built as, possibly, as close to a fairy tale castle as possible? It would be a dream come true! I would certainly recommend this book and hope to get a hard copy sometime. 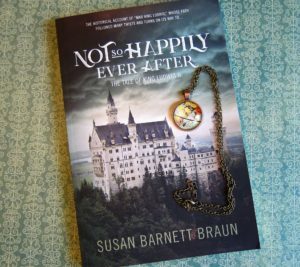 To celebrate her tour, Susan is giving away a grand prize of a world/globe necklace and a paperback copy of the book!! Susan Barnett Braun earned a BS in retail management from Indiana University and an MA in education from the University of Alabama. She taught for eight years in northeast Indiana, earning a Lilly Endowment Teacher Creativity Fellowship and a National Endowment for the Humanities Summer Study Scholarship. Susan has had work published in Parents, Children’s Ministry, and The Secret Place. 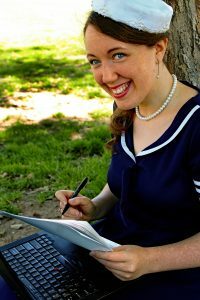 She also writes online for Fort Wayne Visitor’s Bureau and blogs at Girls in White Dresses. She is married with three wonderful young adult daughters. Susan enjoys reading, playing piano and organ, and spending her time with her family and pets (currently three rabbits and a chinchilla). Something niggled at the back of my mind after reading this book. The story, despite my struggles with the present tense author voice, did prove to stay interesting enough to keep my attention. The clues to Jenna’s secret did feel a bit put off and contrived, but only a very little. I rather liked Sarah, and the variety of nationalities and personalities among the characters themselves showed through quite well most of the time. While the descriptions felt a little too descriptive for my taste, I consider that preference, and I really was able to picture the vineyards, the slopes, and the Bolivian village with great clarity, thanks to the colorful manner used by the author. After consideration though, I finally hit upon what bothered me the most about Shadow Sister. For claiming to have a Christian undercurrent – for the majority of the main characters having claimed Christ and mentioning Jesus on multiple occasions, – this book did not have an undercurrent of Christian worldview. 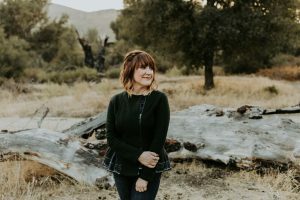 One of the characters is touted as almost a saint by the words of several characters, but almost none of her actions are ones that stem directly from a Biblical framework. The book claimed to be centered in an area where women are regarded as property and are presumably ill-used by their husbands, but with one single exception, the “mistreatment” is never shown. Instead, the life of a wife and mother is downplayed, and the need for an education, the ability to hold down a job, and be able to “stand up to” one’s husband are the main things that are pushed for this Bolivian community. While, I won’t ever say one shouldn’t be able to read – it’s a grand thing and reading the Bible should be one of the chief pleasures for an able Christian – none of these things are pushed in the Bible. It’s not a requisite, while honoring one’s husband is, and the tone of the book pushed education above that Biblical mandate. The ghost of Sarah’s sister passing around in two houses after death also threw me off. No where, do I see a Biblical framework for such a thing, though the book tried to make it link in with the story of Lazarus. Perhaps my greatest issue with the book though is how the author dealt with the sin of marital infidelity. The Bible places strong emphasis on the importance of staying true to your own husband or wife. Jesus, Paul, the book of Proverbs… While one person mentions in, almost in passing, that “it was wrong” there was very little weight given to the sin. Sure, consequences are shown to an extent, but not really. It was almost excused. One of the people in question, treated with a pity that he in no way deserved. If this had been a secular book, I wouldn’t have been surprised and would have rated the book higher – I wouldn’t have expected a stronger moral compass. However, the claims of Christianity, led me to disappointment and sorrow at the way in which adultery and even fornication were handled. Why the characters fell into this sin doesn’t matter, they did it, and it should be shown as the sin that it is, if it is to be included in the story. Also, the lying behavior of another character in another topic altogether was excused on account of fear. While I can agree that fear will lead to sin, it does not excuse it. Lying, even by omission, is bearing a false witness and is, therefore, a sin. Exodus 20:16. It should not be justified. Forgiven? Yes. Grace extended? Yes. Absolutely. I agree with the forgiveness shown, but the reasons behind a sin do not mitigate the sin. The lies allowed by this character caused deep wounds in those nearest them, which were shown very well. The writer handled betrayal and rejection well, I thought, up until the moment the reason for the sin seemed to wipe away everything else. 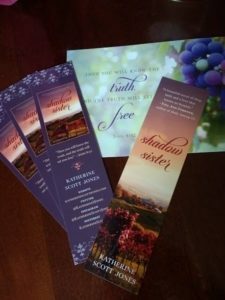 In conclusion, while an interesting story and even a good mystery, I could not recommend Shadow Sister. This entry was posted in At the Printing Press and tagged Book Reviews, Celebrate Lit. I am always loth to read a series. I possess a certain, perhaps unfounded and odd, fear that if I like a book, the author will inevitably ruin the story in the following books. 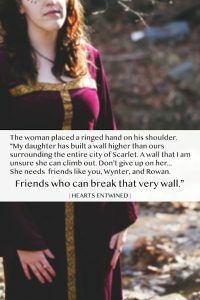 Hearts Entwined is Volume 3 in The Wyvern Tales. It can be read as a standalone from its predecessors, but it certainly builds on their story – and without ruining anything. 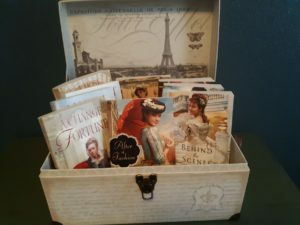 My favorite characters from The Scarlet Rose are still as noble and lovable as before; and I found several new favorites. Coen is, possibly, at the top of my favorites list. I certainly related to him the most. Rowan, Wynter, Jana, and Kicster were other new favorites and weren’t terribly far behind. Kicster, indeed, did not have nearly enough page time. He needed several more… chapters. In my opinion, anyhow. I enjoyed the overall story. The message of friendship, loyalty, and broken trust is a difficult one, but a message that ought to be heard. The mystery behind the past of one character particularly, is well hinted at, but not at all annoying as I have found some books, though intriguing. Finally, I did approach the book with some trepidation, wondering how the narrator voice might be affected by Morgan Myomoto’s co-authorship with Erin Nichole, who has previously written on her own. I had no need to worry. The story telling fared well in the hands of both authors, living up to the previous works. 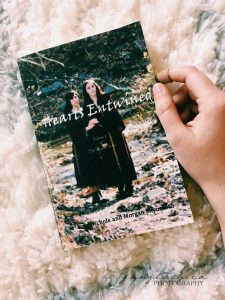 Hearts Entwined is currently on sale for .99 for Kindle, so get it while you have a chance! This entry was posted in At the Bookshelf and tagged Book Reviews. For centuries the small port town of Points Worth has been able to communicate with the ocean in its own language. But the water has just gone silent and its last word has shaken those able to translate it. A knowledge of sea-script won’t be enough to mend the broken relationship between man and the deep. Gil, a young nautical linguist, will have to break rules and search the past to discover why the ocean ceased its tides—or had them stolen. Points Worth is a novelette set in the world of Kingdom of Ruins, and is a prequel to the first book in the series. For being so short, I found this story to be surprisingly enjoyable. To be honest, I read it because a friend of mine said she loved it, but I had low expectations. It took me two or three pages to get into the story, but once I did, I found the story fascinating, the author’s voice pleasant, and the main character likable. I’m looking forward to reading the novel that follows! I would certainly recommend this book! To celebrate the tour, Celebrate Lit is giving away a grand prize of a $25 Amazon gift card!! Receive a FREE story when you sign up for my Newsletter!